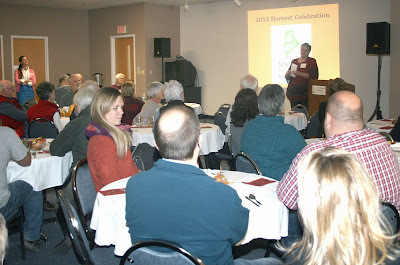 On Thursday, November 22, local farmers, partner agencies, funders and Food Bank staff gathered in Auburn for a celebration of the 2013 harvest. The Food Bank's Mainers Feeding Mainers program is providing fresh, local produce to hunger relief agencies throughout the state - and it's showcasing the power of collaboration in the process. This year, the Food Bank partnered with 20 farms to purchase fruits and vegetables for our hunger relief network. While we are still receiving some items, including root vegetables and apples, in total we have received 850,000 lbs. of local produce this season. Of that, the Food Bank purchased 400,000 lbs. and the additional 450,000 lbs. was donated by our farm partners. To learn more about Mainers Feeding Mainers, visit our website or contact Nancy Perry, Food Sourcing Director, at nperry@gsfb.org.